My mom makes the most delicious chicken asopao as we call it in Puerto Rico. My cousins seem dissapointed when there is a party at my parents and my mom opted for a different menu. Asopao is a sort of gumbo, a thick hearty soup. 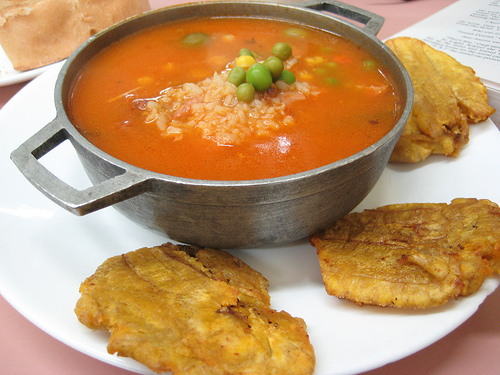 You can make giant pots of them to serve with bread slices or fried plantain (my favorite). It is a very affordable way to entertain and a healthy comfort food. And it tastes it’s best the next day. My sister is currently doing the cooking at my house and was more than happy to share the “secret ” recipe. Heat the oil in a deep pot and add the annatto, cook the chicken on medium low heat but don’t brown it, just enough to seal it. Add the sofrito, garlic, ham and let it cook from 3-5 minutes. In a saucepan, boil the water with the bouillon cubesand when it is ready add it to the pot with the chicken mixture and mix well. Add the potatoes and carrots. Turn the temperature to medium and cover. Let it simmer until the potatoes are almost done and then add the rice. When the rice is cooked, then is ready to serve. If the soup becomes too thick, you can always add more bouillon.